assaults was jailed for eight months last Thursday at Banbridge Magistrates Court. He was Curtis Rodgers, whose address was given as Chestnut Place, Banbridge. Rodgers was charged with common assault on a female on April 17, criminal damage to clothing on the same date, criminal damage to a car windscreen on April 25, making a threat to destroy a property belonging to a different female, assaulting that female, common assault and criminal damage to an iPod. He was also accused of common assault on April 23 and 24 this year, criminal damage to a mobile phone on April 23 and criminal damage to a window on April 25. For the threat to destroy property, Rodgers was sentenced to eight months in custody while six-month terms were imposed for the criminal damage charges and three months for the assaults. All the terms are to run concurrently, making a total of eight months in custody. The court heard that on April 25 this year, police received a report of domestic abuse from the injured party. When she had advised the defendant that she wanted to end their relationship he spat in her face and grabbed her by the throat. Rodgers then struck her with a dog chain. He held her down on a sofa and this went on for about an hour. Rodgers began to apologise but then became abusive. He found a ring she had lost and threw it at her, hitting her on the bridge of the nose and causing a cut. The following day she got out of bed because she couldn’t sleep and started to wash the dishes. Rodgers became abusive and called her a ‘fenian b—d’ and a ‘dirty tramp’. He grabbed her arms and dragged her onto the sofa where he punched her on the chest and kicked her on the legs. 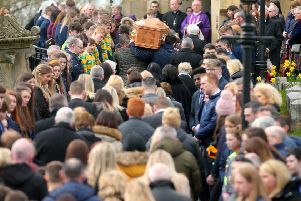 In the early hours of April 25 she made an attempt to leave by getting out of a window but he followed her into Banbridge and on the Lurgan Road spat in her face and punched her in the stomach. Rodgers took her iPod and smashed it on the ground. He continued to be aggressive and dragged her back towards the house. The victim said that in the early hours she saw the defendant pick up a stone and throw it at a car, breaking the windscreen. She also reported that on April 19 when Rodgers was on bail he threw her on the floor, kicked her and spat in her face. While she was lying on a bed he tipped the mattress onto the floor. When she tried to leave he dragged her back in and head-butted her. The court was told that another female tried to intervene in the situation but Rodgers told her he would get the UDA to burn her house. A public prosecutor said that because of the terms used by defendant – fenian b—d – this should be treated as a hate crime. Rodgers appeared in court in the dock because of a breach of bail as the previous day in Belfast he had been found in possession of cannabis. A barrister representing Rodgers said this breach was accepted by his client. He added that the injured party had the good sense to terminate the relationship and there was no prospect of any reconciliation. The barrister said that Rodgers had been abusing legal highs and this had a profound effect on his behaviour. He was out of his mind and acting irrationally. He added that his client had spent time in custody and this had a salutary effect on him. He is the subject of an enhanced combination order and last week at Craigavon had received a suspended sentence. District Judge Eamonn King said there was a litany of assaults by Rodgers against his girlfriend as well as threats, assaults, insults, abuse and threats to damage property. He said that the defendant had been remanded in custody but had been let out and then there were numerous court appearances where bail was revoked but he was let out again. “You may as well have written the bail conditions on a piece of tissue paper for the attention he paid to them,” said the judge. He added that there was one thing obviously clear to the court as far as Rodgers was concerned and that was that he didn’t give one iota about the people around him. “As far as he is concerned the whole world has to dance to his tune,” said the judge. He said that a woman had intervened when she realised what was happening and how Rodgers had told her that for £150 he would get an organisation to have her house wrecked and her car burned.